I finally found and fixed what makes a companion NEVER SHUT UP when dismissed, and they just walk around endlessly spouting their lines. While I was at it, I made several versions so you can choose how long they stay quiet between lines. Added compatibility with Unlimited Companion Framework. No more constant chatterspam from companions you've dismissed to settlements. Maybe you can bring them all back from Murkwater now. Super Burnout Edition for your 47th playthrough! You have to take and then dismiss a companion for the fix to be applied to them! is simple, if you insist: take one of the followersscript.pex files you'll find in the archive. The folders are named by the Min and Max intervals (in seconds) they wait before saying a random line. 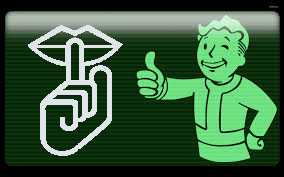 Drop the .pex of your choice in [your Fallout 4 install folder]\Data\scripts aaaaand that's it. If you have Unlimited Companion Framework, make sure to grab one from the UCF folders! Version 1.1 of this patch now includes installer options for compatibility with UCF. This fix is integrated into version 3.x of EBF, so no need for this patch with that - just update EBF to 3.x+ and you're good. F O R E V E R.
Massive credit also goes to Wenderer for his FOMOD Creation Tool. This thing is awesome and saves a TON of time getting stuff packed up. Think it's silly needing to be a politition and salesman to program your robots? Now the Robotics Expert perk works too! Time to build your robot army! Tired of your companions standing on your head when you stealth? Now with Less Dogmeat Standing on Loot! Still some. Just much, much less. A permanent fix for the bug that makes Companions spout all their comments endlessly after you dismiss them. You know, maybe I like the rain, Preston! Custom interval times available! Not a damage number tweak, but a changed mechanic. Preserves balance and ammo, and adds fun. Shows the raw component totals from all the junk in your Workshops, local or linked. Permanently destroyed PA pieces. Fewer and randomly-charged Fusion Cores. Tougher requirements for repairs. for the Fusion Gun by Fallout Suite (not me), tagging it like Valdacil's Item Sorting (also not me) using AWKCR (still not me).